Monet's gardens in Giverny are lush and beautiful, and it is easy to understand why the artist chose to live among such beauty. 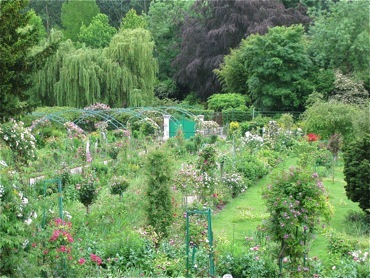 Monet lived in Giverny from 1883 until his death in 1926. Over the years, he built and expanded his gardens, creating a masterpiece of nature. Views from his house show the lushness of the gardens. I visited Giverny in the late spring when the poppies were in bloom, the roses were in full blossom, geraniums were abundant, and a few irises remained. 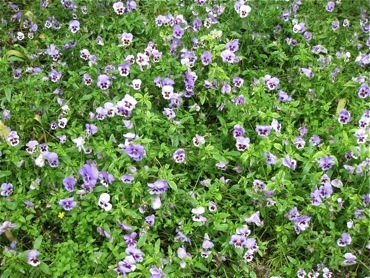 In addition to the formal gardens, there were also occasional patches of wild flowers. I passed these pansies as I walked over to the water lily pond. 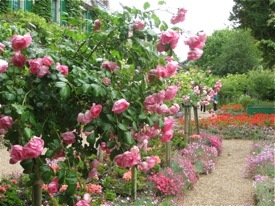 Even though I visited on a cloudy day, the beauty of Monet's gardens shone through, and the colors and variety were marvellous. Perhaps the gloomy day made it a more Impressionistic experience. 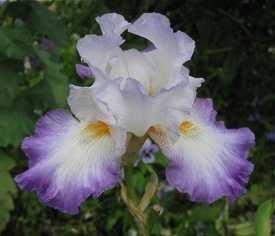 Above: One of the last irises of the season at Monet's home in Giverny, France. 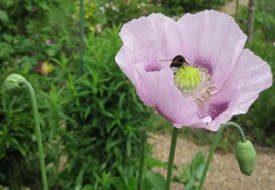 Below: A bee visits a delicate poppy, Giverny.